Simply visit one of your notes in Evernote, click in the editor portion to go into edit mode (this is important – otherwise it won’t always edit the most recent note content), then click your new bookmarklet. 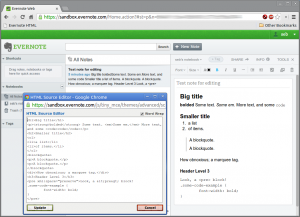 A plaintext html editor should pop up, and clikcking update will return you to the note with your updated content. Disclaimer: this is interacting with Evernote in a way they a) don’t document and b) probably wouldn’t recommend, but it’s useful until they add a native “edit source” feature, so please don’t hold me responsible if something goes wrong! There’s also an ENML editor plugin thing here that lets you actually edit the underlying source of the note itself (not just its content as presented by the editor) but that requires you give the app access to your Evernote account, and sometimes for quick formatting edits whilst you’re mid-flow, is a bit much. It’s also a bit easier to completely break your notes as it edits all aspects of the note, not just the body (unlike the bookmarklet). Sometimes though, that’s exactly what you need..
Works fine, it will help me a lot. This was exactly what I needed and it works a treat. Thanks for posting it! FYI I made them in a notebook “Templates” and will export for learners and add to my materials. Great! Glad it was useful for you; I’ve just updated it so it works with the new Evernote updates too! WHOA! JUST WHAT I NEEDED! THANKS MAN! I just fixed it! Please let me know if it’s still not working for you and I’ll do my best to make it work! Nice, thanks! Works in IE but not Chrome or Firefox. In Chrome, nothing happens. In Firefox, the HTML is briefly displayed then disappears leaving the word “true” as the only content of the window. That’s very strange – I’ve just tested it in Firefox and Chrome (and Chrome is my main browser that I used to make it) and it works fine – have you got any script blockers or something stopping it? Thank you for the analysis and bookmarklet. What tool did you use for preparing the bookmarklet? Ditto, doesn’t work for me in Firefox. Actually what I really want to do, is to inject some tools…specifically floating images. I can attach, drag, but I need to directly edit html to make them float. 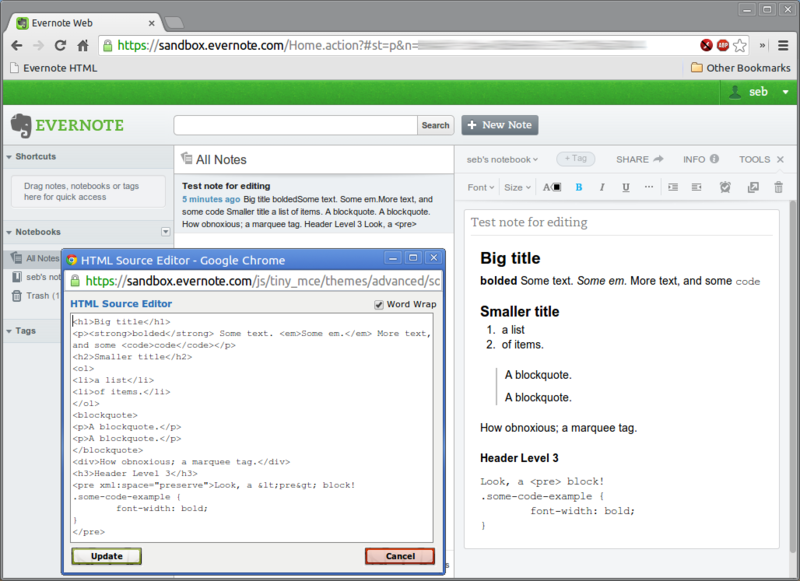 browse to the bookmarkleter mentioned above (http://chriszarate.github.io/bookmarkleter/) and copy paste the code above (after “What the bookmarklet does”). Make sure to only select URL Encode, not the others … and drag this bookmarklet to your bookmarks bar. Just wanted to thank you. This is awesome! I wish I could buy you a pint! No… make that two pints! Also, if that pint offer still stands…. I’ve added a PayPal donate button 😉 if only my local accepted PayPal! Thank you, thank you, thank you. I have been going insane with Evernote screwing up div heights. That’s very handy! 🙂 Thank you for posting it. Have you considered turning it into a user-script maybe also with a button (in the Evernote interface) that can be clicked to trigger it? I usually use Chromium in app-mode to run Evernote Web, so there are no toolbars. Great. 🙂 In the meawhile, I published a new script that gives the in-app note link of any note, to make cross-references. You can find it linked in the description of the HTML editor script. Thanks for this. Now I’m trying to figure out Lazza’s script. I’m basically green when it comes to code and such things. Your bookmarklet works great though. What i”m finding is that the un-formatted HTML is such as mess I can’t work on it. Thanks, Lazza. I’m sorry but I’m not clear what extension to add to my browser. I run Chrome in Windows 10. I can’t seem to understand how to install the script. May I know why you left a negative review on my script if you didn’t install it yet? 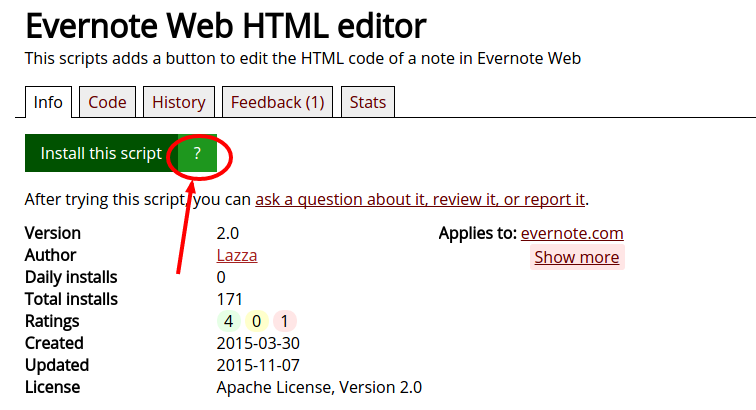 Hi Lazza–my bad leaving negative feedback. Was trying to leave status, I added a new comment. I’m trying to get it to work using Tampermonkey, thanks. I have it working now and it is great. This is really what I needed. I want to be clear that I apologize for my feedback blunder on Greasy Fork and I have updated to positive. Thanks to Lazza for helping me. Just another update, now that I have been working with this for a while. I’m getting the hang of the oddities in ENML and how to clean them out. The editor is very good for this, as it nicely highlights un-paired html elements (like matching a /div with a div and vice versa). The captures into ENML are VERY VERY messy, I have found it helpful to copy from the editor to a text editor and remove junk with search/replace, then paste back and tidy up in Lazza’a editor. Do you mean that ENML code shows up in the HTML box when you use my script? Uhm, that’s a bit strange… it should show HTML only. Do you have an example note you could share?